As a city full of art and culture, it's the biker, builder and enthusiast in Bali are really concerned modification of existing local wealth. This two-wheel artists do not want to just follow the world trend, but local elements must be able to give donations. 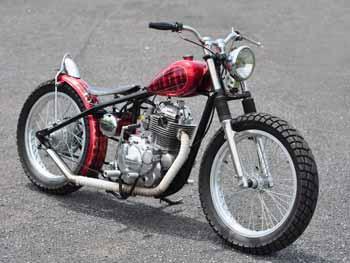 For example, Kawasaki KZ200 of this Custom. According Bagoes, the owner of the motorcycle world the virus combines seed in HD overseas magazines with elements of Balinese culture, which certainly also worldwide. 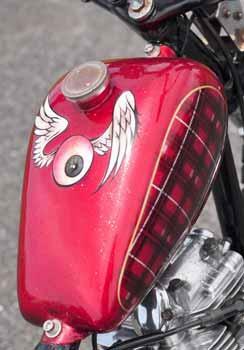 "That we can see in the motifs painted on the tank" said the artist paints based on Jl. Daffodils, No. 30, Denpasar. Artha Wiguna the owner of the motor wants to have Balinese sarong motif is very popular on the bike. "It's actually a simple motif, is not only just boxes. But of course there must be other effects derived from choosing this form," said Bagoes again. If a Balinese sarong usually patterned black and white box, then the motor is shown with a black rigid red. "Also on each box is also a kind of gradation so that there are effects that lead to three-dimensional shape," he said again. In addition, modern element that is currently also applied. "For the community in Bali when the motor is the use of paint with glitter effect again many requester. It is happening again in Bali," added the modifier is indeed a place hang out HD and fans of this great motorcycle. Local culture can be side by side with a virus or world trends. 3 Tanggapan untuk "Bali Chopper Modification"
can u build a chopper for me?...please reply!!! We are only wrote the article about modification, not a chopper builder. Thanks.